Director – Todor Chapkanov, Screenplay – Denyc, Producers – Phillip Roth, Devi Singh & Kirk Shaw, Photography – Ivo Peitchev, Music – Paul Michael Thomas, Visual Effects Supervisor – Nikolay Atansov, Special Effects Supervisor – Georgi Kraev, Production Design – Kess Bonnet. Production Company – BUFO (Bulgarian Unified Film Organization, Ltd)/Odyssey Media Inc./MOD Productions. Billionaire William S. Hadden has had his people collect the twelve crystal skulls from all over the world, artefacts of great power that are over five thousand years old. His associate Mitchell returns to Hadden’s headquarters in Vienna with what is believed to be the thirteenth and final crystal skull. However, unknown too him, this is a fake. When it is brought together in a laboratory with the other skulls, it causes them to unite and give off a massive EMP discharge. Meanwhile, archaeologist John Winston has been on an expedition to Sweden following the clues in his father’s notebooks in a search for the thirteenth skull, only for a cave collapse to kill his brother Terry. John returns to the USA to find his academic tenure has been cancelled on the insistence of powerful donors. He is then forcibly recruited by Hadden’s people who want him to locate the thirteenth skull. Hadden explains that he has brought the skulls together, seeking a cure to his cancer, but the energy discharge caused by the fake skull has created a second magnetic field around the Earth that is wreaking havoc with weather. John, accompanied by Hadden’s daughter Sienna, must return to the cave in Sweden and follow the trail left in his father’s cryptic messages. Their journey is beset by people ruthlessly determined to stop them and the military who have decided to call a nuclear strike on Vienna to stop the menace of the skulls. Crystal Skulls is another of the cheap disaster movies that clog up the Syfy Channel. See also The Black Hole (2006), Meltdown: Days of Destruction (2006) , NYC: Tornado Terror (2008), Lava Storm (2008), Annihilation Earth (2009), Ice Twisters (2009), Megafault (2009), Polar Storm (2009), Arctic Blast (2010), Ice Quake (2010), Meteor Storm (2010), Quantum Apocalypse (2010), Stonehenge Apocalypse (2010), Behemoth (2011), Collision Earth (2011), Earth’s Final Hours (2011), Mega Cyclone (2011), Metal Tornado (2011), Seeds of Destruction/The Terror Beneath (2011), Miami Magma (2011), Super Eruption (2011), Super Tanker (2011), 2012 Ice Age (2011), Seattle Super Storm (2012), 500 MPH Storm (2013), Jet Stream (2013), 100° Below 0 (2013), Stonados (2013), Asteroid vs Earth (2014), Christmas Icetastrophe (2014), Firequake (2014), LA Apocalypse (2014), San Andreas Quake (2015) and Stormageddon (2015). It was made by the production company of sometimes director Phillip Roth, United Film Organization, which usually shoots low-budget genre films in Bulgaria. (Now the company has been renamed the Bulgarian Unified Film Organization). Crystal Skulls feels exactly as though UFO (or BUFO) were running out of ideas for new disaster movies and tried to see what would happen if they conceptually mashed one of their disaster movies up with Indiana Jones and the Kingdom of the Crystal Skull (2008). As a result, Crystal Skulls sits as an ungainly beast that is part ultra-cheap Syfy Channel disaster movie, part Indiana Jones adventure and part Ancient Astronauts mystery about alien artefacts buried around the world. Not too surprisingly, it satisfies at being none of these. There are undeniable similarities to the similar Syfy Channel disaster movie Stonehenge Apocalypse (2010), which featured a worldwide catastrophe caused when the alien artefacts left at Stonehenge were reactivated. What we end up with feels like a low-budget film that avoids any of the interesting things that its bizarre conceptual mash-up seems to be pushing it towards. It wants to be a globe-spinning Indiana Jones-type adventure about piecing together clues in order to save the world – a potential idea that could have worked well on a decent budget. 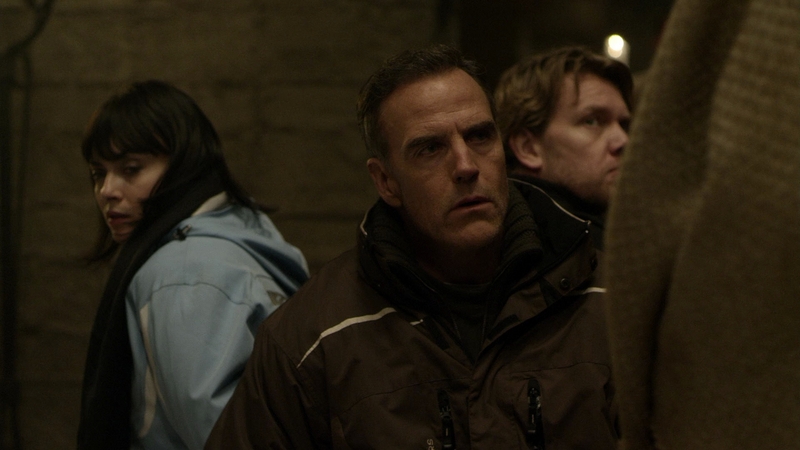 Richard Burgi makes a serviceable archaeologist hero but the film is exceedingly sparing when it comes to the sort of tomb raiding adventures that you expect of it. There is a single tomb that is ventured into twice and a mountain that we expect to venture into only to instead get waylaid into the stronghold of a secret cult protecting the thirteenth skull and that is the sum of it. Equally, on the other side of things, the film raises the fascinating mystery of the crystal skulls. These are a series of real artefacts that were supposedly discovered in the 19th Century and claimed to be Mayan or Aztec in origin, although under detailed examination were discovered to have been fabricated by techniques available only in the modern era. The film offers up the amusing straight-faced claim that billionaire David Rintoul’s people faked the carbon dating and they are much older. That said, Crystal Skulls frustratingly reaches an end giving us no clue whatsoever as to where they came from or their intended purpose. The other laughable thing is how the film even fails to be the disaster movie it sets out to be – we get two scenes where the EMP pulse goes up seen from wide angle but thereafter everything else is ultra-cheaply conveyed in terms of a bunch of newscasters standing in what we are told international locations merely describing the supposed catastrophic weather anomalies we are seeing. Crystal Skulls comes from Bulgarian director Todor Chapkanov who has also made a number of genre films for Roth and UFO with the likes of Copperhead (2008), Ghost Town (2009), True Bloodthirst (2012) and Viking Quest (2014), as well as several films for other companies with Monsterwolf (2010), Miami Magma (2011), Storm War (2011) and Asylum (2014). United (sometimes Unified) Film Organization (UFO)’s other genre films include:- Darkdrive (1996), Total Reality (1997), Interceptors (1999), Storm (1999), Deep Core (2000), Epoch (2000), Falcon Down (2000), Mindstorm (2000), Python (2000), Lost Voyage (2001), Shark Hunter (2001), Antibody (2002), Dark Descent (2002), Hyper Sonic (2002), Interceptor Force 2 (2002), Pythons (2002), Dark Waters (2003), Deep Shock (2003), Dragonfighter (2003), Maximum Velocity (2003), Warnings/Silent Warnings (2003), Boa vs Python (2004), Darklight (2004), Dragon Storm (2004), Phantom Force (2004), Post Impact (2004), Alien Siege (2005), Crimson Force (2005), Locusts: The 8th Plague (2005), Manticore (2005), Path of Destruction (2005), S.S. Doomtrooper (2006), Reign of the Gargoyles (2007), Copperhead (2008), Ghost Voyage (2008), Doomsday (2009), Ghost Town (2009), The Grudge 3 (2009), Star Runners (2009), Arctic Predator (2010), Elimination (2010), Lake Placid 3 (2010), Triassic Attack (2010), Cold Fusion (2011), Miami Magma (2011), Morlocks (2011), Rage of the Yeti (2011), Super Eruption (2011), Super Tanker (2011), Black Forest (2012), Boogeyman (2012), Lake Placid: The Final Chapter (2012), True Bloodthirst (2012), Wrong Turn 5: Bloodlines (2012), Deadly Descent (2013), Invasion Roswell (2013), Jet Stream (2013), Robocroc (2013), Super Collider (2013), Firequake (2014), Wrong Turn 6: Last Resort (2014), Lake Placid vs Anaconda (2015) and Roboshark (2015).